A Spread Order is a combo order used for rolling over future positions from one expiry to another in the stock markets. Suppose somebody has a buy open position in Nifty futures contract expiring on the last Thursday of the month. On or before the expiry date, if he wishes to carry forward his position to the next month he can do it manually by selling the current month’s contract and buying the next month’s Nifty Future. However, there is always a probability that while doing the above execution manually there can be a difference in the execution price. For instance, if the current month Nifty futures is trading at 8050 & the next month’s futures contract is trading at 8100. So the price difference is Rs. 50. However, suppose a trader first sells current month nifty future at 8050 but while buying the next month’s contract the price moves up to 8110. So instead of a difference of Rs.50, the customer would have to incur a difference of Rs. 60 resulting in an execution loss of Rs. 10. The solution to the above problem is using the “Spread Order” while trading with SAMCO. All one needs to do is put the price difference which a trader is willing to for the above transaction, say 50 in the above case. All he needs to do is put a “Buy Spread Order” with a buy price of Rs. 50 and if someone else in the market wishes to convert a reverse position (i.e. to buy the current month contract and sell the next month) he will put a “Sell Spread Order” at Rs. 50. A Buy Spread order is used for rolling over a buy (long) position to the next month and the trade involves selling current month’s contract and buying next month’s contract. A Sell Spread order is used for rolling over a sell (short) position to the next month and the trade involves buying current month’s contract and selling next month’s contract. Also if you put 2 limit orders for buying and selling the margin required to enter the trades would be different for both the contracts. For Nifty, you would require approximately Rs. 97,000. 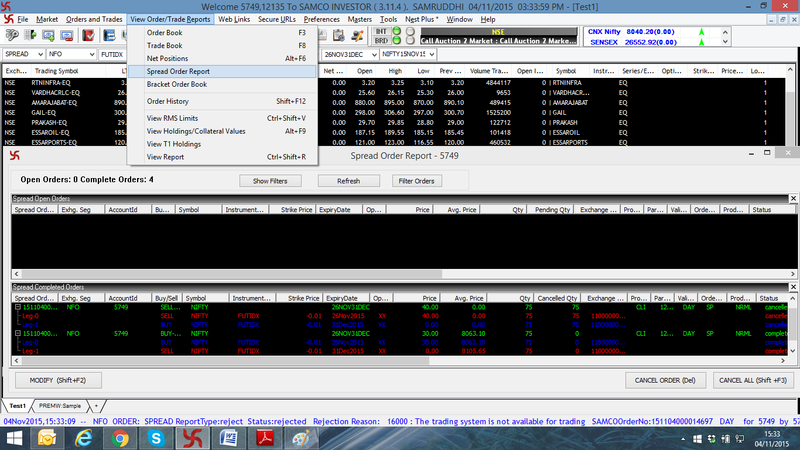 However, with the spread order the margin required would be around Rs. 12,450. Start taking the benefits of the Spread Order today!